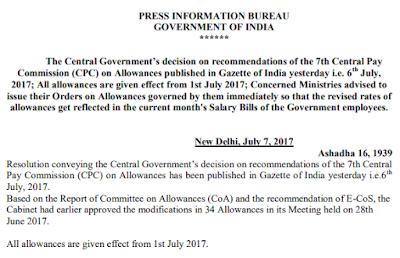 The Central Government’s decision on recommendations of the 7th Central Pay Commission (CPC) on Allowances published in Gazette of India yesterday i.e. 6th July, 2017; All allowances are given effect from 1st July 2017; Concerned Ministries advised to issue their Orders on Allowances governed by them immediately so that the revised rates of allowances get reflected in the current month's Salary Bills of the Government employees. Concerned Ministries have now been advised to issue their Orders on Allowances governed by them immediately so that the revised rates of allowances get reflected in the current month's Salary Bills of the Government employees. COBRA Allowance granted to CRPF personnel in Naxal hit areas increased from ₹8400 - ₹16800 pm to ₹17300 – ₹25000 pm Modified Field, Field & Highly Active Field Area Allowances increased from ₹1200 - ₹12600 pm to ₹6000 – ₹16900 pm. High Altitude Allowance increased from ₹810 - ₹16800 pm to ₹2700 – ₹25000 pm. Territorial Army Allowance increased from ₹175 - ₹450 pm to ₹1000 –₹ 2000 pm. Ceilings of Deputation (Duty) Allowance for Defence Personnel increased from ₹2000 - ₹4500 pm to ₹4500 - ₹9000 pm. Detachment Allowance increased ₹165 - ₹780 per day to ₹405 – ₹1170 per day. Para Jump Instructor Allowance increased from ₹2700/3600 pm to ₹6000/10500 pm. Hospital Patient Care Allowance/Patient Care Allowance increased from ₹2070 - ₹2100 pm to ₹4100 – ₹5300 pm. Cycle Allowance not abolished - rates doubled from ₹90 to ₹180 pm for functional requirements of Postmen in Posts and Trackmen in Railways.